Lightweight and well balanced at 6.6 pounds. Includes the convenient ACU-52 cocking mechanism. Provides a smooth draw for accurate shots. Comes with an adjustable 3 dot scope. Below you can read our Wicked Ridge Invader G3 Crossbow Review and find out why it is considered one of the best value for money crossbows out there nowadays. Winner of the Best Value Award from Petersen’s Hunting, the Wicked Ridge Invader G3 crossbow comes with a durable build and high performance design. It is also priced to fit most budgets, which is surprising considering how well it performs. Easy to draw and quiet, this crossbow can help you take down a buck or hit every target on the practice field. Weighing only 6.6 pounds, the redesigned Invader G3 crossbow is sturdy, lightweight, and easy to handle. Whether you are sighting in on a deer or lining up with a box target this bow will help ensure your shot isn’t wasted. The black limbs feature a tactical build that is sturdy enough to handle rough hunting conditions, while also providing plenty of stability and support for the aluminum riser. The limbs also include TenPoint’s energy wheel which helps to ensure a smooth and easy draw. The aluminum riser is machined to limit weight and the cutouts are strategically placed for additional strength. When it is combined with the sturdy limbs and energy wheel, you have a bow that is capable of speeds up to 330 feet per second. This gives you plenty of speed to keep up with the fastest prey. While you want a bow that is fast and powerful, it should also feature a stylish and functional design that is easy to use. The Invader G3 is designed to be assembled in seconds and comes with helpful instructions that will walk you through the simple steps. The scope is also designed to be easy to sight, which is always an advantage whether you are a novice or experienced hunter. Safety is always important when you are handling crossbows, and the Wicked Ridge Invader G3 is designed with this in mind. The partially skeletal stock not only looks impressive, it also works to improve safety and function. It is designed to keep your hand safely below the string while also minimizing any additional weight on the stock. The foregrip is longer on the Invader G3 and its pass through design includes reinforced safety wings. Constructed from a durable nylon material, it will help you stay safe when you are drawing and releasing the bow string. There is very little not to like about the performance capabilities of this crossbow. Capable of speeds up to 330 feet per second, the combination of the limbs, riser and energy wheel will give you a reliable and smooth performance. The 19 inch axel is comfortable for most archers and the 165 pound draw weight pulls smoothly and easily. With its smooth and powerful performance capabilities it’s hard to believe that this crossbow also comes at an affordable price. Adding to its high rated performance is its quiet design. The smooth draw assembly ensures that each pull glides seamlessly without and creaks or bumps. The arrow also releases without any noise, which is always appreciate by your hunting partners. With the crossbow’s quiet design, you can easily sneak up on your prey for an accurate and humane killing shot. Some of the innovative features that helped the Invader G3 earn its “Best Value” award include its dry fire inhibitor and reknowned T2 trigger. The dry fire inhibitor works to prevent expensive damage to the bow that can ruin its accuracy and performance. The 3.5 pound trigger has a “crisp” feel and is easy to pull without being too soft. 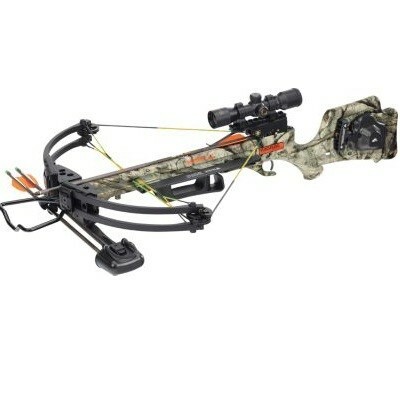 The camouflage patterned bow also features the ACU-52 cocking system, and includes everything you need to start hunting. The 3x scope is easy to adjust for shots at 30 or 40 yards, though it should be mentioned that it can fog up easily in damp conditions. The convenient quiver will help you keep track of the 20 inch carbon arrows, which at 3,400 grain are powerful enough to penetrate cleanly through muscle and bone. Designed for speed and performance, but to also offer archers a good value for their money the Invader G3 is an excellent crossbow for beginners and experienced hunters. It features a smooth and perform design that is capable of speeds up to 330 feet per second and a draw rate of 165 pounds that can be easily pulled by almost everyone. Since the bow is also designed with safety in mind it is ideal for beginners just learning the basics of archery. The stock features a cool partial skeletal design that also encourages you to correctly place you hand well below the release path of the string and arrow, and the nylon wings provide you with added protection. You will also love the feel of the T2 trigger that doesn’t add any noticeable weight to the crossbow.